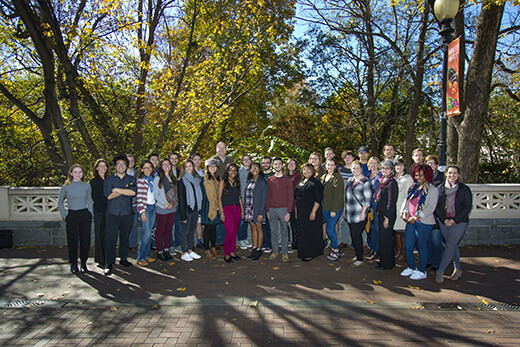 Last fall, OSI opened applications for its annual small grants programs, which are intended to support innovative, campus-based projects and research to enhance social justice and sustainable practices, knowledge and behaviors at Emory. The General Sustainability & Social Justice Incentives Fund allows all Emory and Emory Healthcare students, faculty and staff to request up to $3,000 for any relevant project or research. The Green Offices Incentives Fund and Green Labs Incentives Fund let Emory offices and labs that are certified through the respective programs request up to $5,000 for proposals that encourage changes in behavior, practices and equipment utilized in these spaces that affect energy, water, waste, safety and health, engagement, procurement and innovation. The money from the funds allows recipients to subsidize the costs of more sustainable options. A committee of Emory students, faculty and staff from across campus in programming, academic and operational roles reviewed all submitted applications. Applications are evaluated for their alignment with Emory’s 2025 Sustainability Vision and Strategic Plan, Emory’s Climate Action Plan, feasibility, clarity, sustained impact and innovation. Kilowatt Smackdown – Free Energy Audit Volunteering with Emory’s Buildings and Local Businesses (Team Leader – Angela Jiang; Faculty Adviser – Daniel Rochberg): Train students to conduct energy audits and make recommendations for making neighborhood buildings more energy-efficient. Vine-Up Peavine on the Peavine Parking Deck (Team Leader – Matthew Heldman; Faculty Adviser – John Wegner): Install a 15’ by 40’ green wall on the South Deck of the Peavine Parking Deck. Recycled Art Competition (Team Leader – Camille Mosley; Faculty Adviser – John Wegner): Bring attention to Emory’s waste production through reimagining waste materials in art. The art will demonstrate the environmental origins of waste products and/or the environmental impacts of human consumption. Apply Regenerative Agriculture Methods in Emory’s Educational Garden Plots (Team Leader – Logan Makinson): Pilot the use of soil content and drainage tests in the Oxford Road Educational Garden plot to assess the effectiveness for use throughout the Emory Educational Gardens. A Novel and Inexpensive Compost-Powered Electricity Generator (Team Leader – Austin Lai; Faculty Advisers – Arri Eisen, David Lynn, Andrea Hershatter): Conduct research to understand how to utilize basic engineering to convert the thermal energy generated from compost into electricity. Promoting Sustainable Transportation via Community Building and Education (Team Leader – Benjamin Kasavan; Faculty Adviser – Davide Fossati): Encourage biking at Emory as a viable and attractive means of transportation and leisure by purchasing supplies for the Fixie, the student-run bike repair center in the Longstreet-Means parking deck, and by facilitating educational events about safe and healthy biking. Making the Switch at Pi Kappa Alpha, Alpha Tau Omega and Sigma Alpha Epsilon (Team Leader – Jonathan Kaminski; Faculty Adviser – John Wegner): Elevate Emory’s Greek housing by switching manual light switches in low-traffic areas to occupancy sensor switches in three fraternity houses as a pilot program. Native Plant Pollinator Garden (Team Leader – Ellen Dymit; Staff Adviser – Emily Dobbs): Establish small gardens of multi-seasonal, Georgia-native plant species around Emory’s campus to support pollinator species through responsible habitat expansion. Atlanta Community Sustainable Art Commission (Team Leader – Angela Giaquinto; Faculty Adviser – Karen Levy): Commission pieces for Emory from one to two local artists that use the underlying theme of social justice and utilize recycled materials. New Educational Garden on Clairmont Campus (Team Leader – Levin Arnsperger): Establish an educational garden on the Clairmont Campus that allows students, faculty and staff to create community while growing food together. Analysis and Communication of Air Pollutants Surrounding Emory University (Team Leader – Ken Wakabayashi; Faculty Adviser – Eri Saikawa): Measure, record and analyze the local air quality around Emory University and create an online network that tracks and communicates daily air quality pollution levels to educate the public. Emory University Hospital Hydroponic Planting Initiative (Team Leader – Cecilia Tran): Use an outdoor self-watering planter to plant tomatoes and herbs to be used in patient meals by EUH chefs. Reducing Carbon Footprint of Solvent Evaporation (Team Leader – David Vogt): Directly reduce the Nathan Jui lab’s carbon footprint by replacing some carbon dioxide condensers with condensers that use recirculating chillers. Blakey Lab Goes Green 2.0: Heating Oil Alternatives (Team Leader – Jacob Burman): Replace oil bath heating with heating-blocks in the Simon Blakey lab to increase safety and decrease waste materials. Installation of Light Motion Sensors in the Whitehead Animal Facility (Team Leader – Maya Meeks): Install motion-activated lights in designated rooms that have minimal traffic to increase energy efficiency in the Whitehead Animal Facility. Hydration Station Installation Implementation at the Miller-Ward Alumni House (Team Leader – Alison Agnew): Install a hydration station on the main level of the Miller-Ward Alumni House to encourage the use of reusable cups. Hydration Stations for Candler School of Theology in the Rita Anne Rollins Building (Team Leader – Sara McKlin): Install hydration stations by retrofitting current water fountains with bottle-filling stations on the 1st-5th floors of the building.